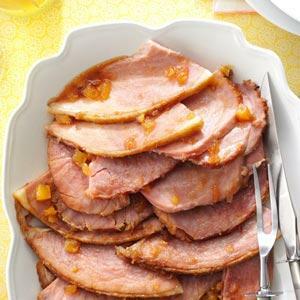 Few foods in a holiday spread are as tempting as a big baked ham. I always hope for leftovers so we can have ham sandwiches in the following days. In a bowl, mix remaining ingredients. Spread over ham. Bake, uncovered, 20-30 minutes longer or until a thermometer reads 140° (do not overcook). Yield: 12 servings.